"There's no proof of anything. But there could very well be," Trump said. President Donald Trump told reporters assembled in the Oval Office on Tuesday that he has "very good information" that there are "Middle Easterners" in the caravan, but admitted he has "no proof." "There's no proof of anything. There's no proof of anything. But there could very well be," Trump said. Trump was asked about why he is implying that "Middle Easterners" are terrorists, and he responded by saying Customs and Border Patrol has intercepted both "good" and "bad" people at the border from the Middle East. "Over the course of the year, over the course of a number of years, they have intercepted many people from the Middle East. They have intercepted ISIS. They have intercepted all sorts of people. They have intercepted good ones and bad ones. They have intercepted wonderful people from the Middle East. And they have intercepted bad ones," Trump said. While meeting with reporters, Trump asked Vice President Mike Pence to comment on his conversation with the president of Honduras. Pence said the caravan was financed by Venezuela. 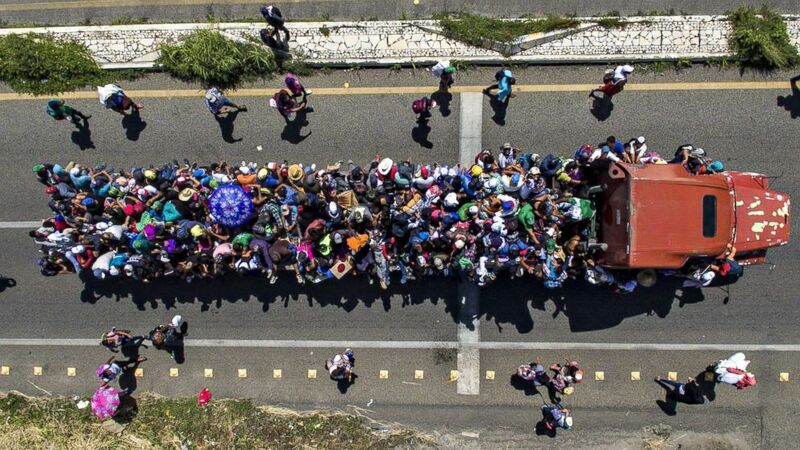 (Pedro Pardo/AFP/Getty Images) Aerial view of Honduran migrants on board a truck as they take part in a caravan heading to the US, in the outskirts of Tapachula, on their way to Huixtla, Chiapas state, Mexico, on Oct. 22, 2018. "At the president's discretion, I spoke to President Hernandez of Honduras," Pence said. 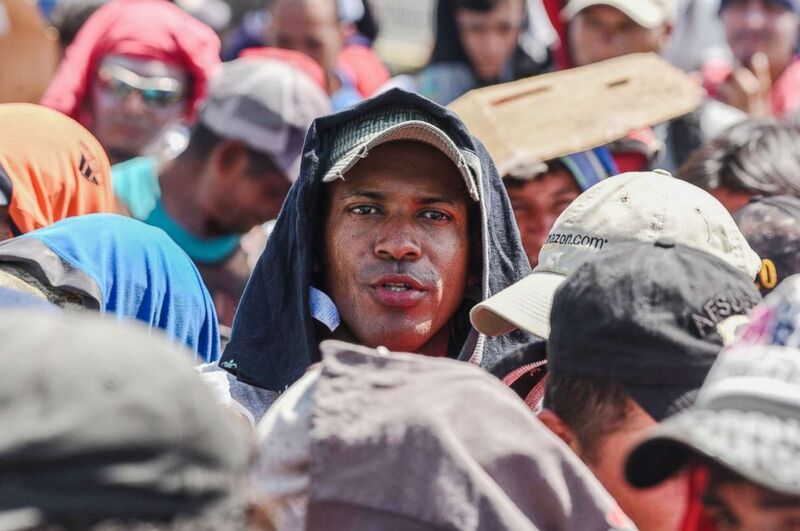 "He told me that the caravan that is now making its way through Mexico, headed for the southern border, was organized by leftist organizations and financed by Venezuela." Pence doubled down earlier Tuesday on the president's assertion that "Middle Easterners" have infiltrated a caravan of Central American migrants traveling through Mexico to the U.S. border. "It's inconceivable that there are not people of Middle Eastern descent in a crowd of more than 7,000 people advancing toward our border," Pence said in a conversation with the Washington Post Tuesday morning. Pence backed up President Donald Trump's statements that people from the Middle East were mixed in with the thousands of migrants traveling to the nation's southern border to escape violence and poverty in their countries. Trump made the comments in a tweet Monday and repeated them during a campaign rally in Houston later that night, also claiming that MS-13 gang members were part of the caravan. 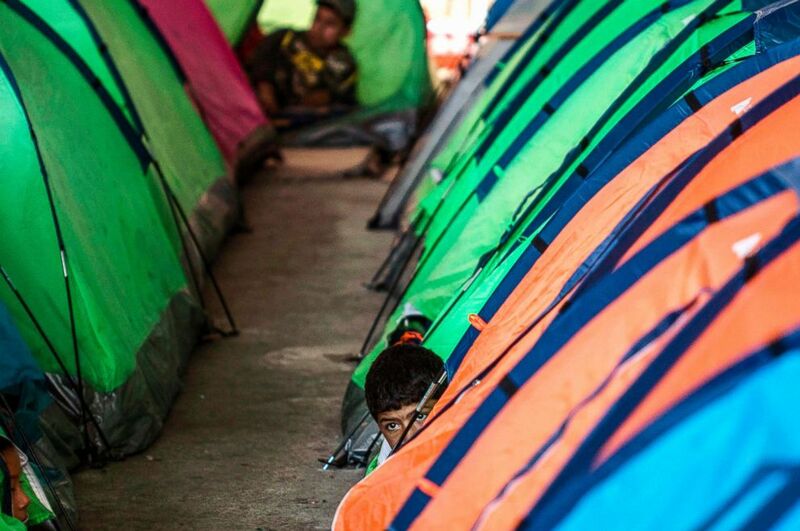 (Guillermo Arias/AFP/Getty Images) A Mexican migrant boy emerges next to tents at a shelter in Tijuana, Baja California state, Mexico, in the border with the U.S., Oct. 22, 2018. During the conversation with The Post, Pence echoed claims made Monday by White House press secretary Sarah Sanders that 10 suspected terrorists a day are apprehended at the southern border, a statistic that has been debunked by members of their own administration. Trump, Pence, and Sanders seemed to conflate "Middle Easterners" with terrorists. In June, Department of Homeland Security Secretary Kirstjen Nielsen said 10 suspected terrorists a day were blocked from boarding flights to the United States from other countries. Nielsen's statements, made during at The International Homeland Security Forum in Israel, had no relation to suspected terrorists detained at the southern border. "In fact, on average, my department now blocks 10 known or suspected terrorists a day from traveling to or attempting to enter the United States," Nielsen said at the time. The State Department released a report on worldwide terrorism last month finding, in part, that while America's southern border is vulnerable, there is "no credible evidence" terrorists have established bases in Mexico or sent operatives through Mexico into the United States. Yet Pence told The Post: "In the last fiscal year, we apprehended more than 10 terrorists or suspected terrorists per day at our southern border from countries that are referred to ... in the lexicon as 'other than Mexico.' That means from the Middle East region." An ABC News crew embedded with the caravan has seen no evidence of Middle Eastern people joining the group. Many members of the caravan are women and children mostly from Honduras and Guatemala, who have told ABC News they were fleeing gang violence and poverty in their respective countries and that their goal is to make it to the United States. In recent days, Trump has attempted to make the migrant caravan a midterm campaign issue by blaming Democrats for not cooperating with him on immigration reform. Senate Minority Leader Chuck Schumer dismissed Trump's claim as a diversion from other issues, particularly health care, ahead of the midterm elections. Efforts to reach a compromise in Congress on immigration reform stalled in June after Trump refused to back a bill that didn't include radical reductions to the current legal immigration system. (Orlando Sierra/AFP/Getty Images) Honduran migrants taking part in a caravan heading to the U.S., wait to cross the border from Ciudad Tecun Uman in Guatemala, to Ciudad Hidalgo, Mexico, Oct. 22, 2018. Thousands of migrants entered Mexico on Friday after they stormed through a fence on the Mexico-Guatemala border in Tecun Uman, pushing back border agents. Border agents fired tear gas at the people as they crossed into Mexico. Since then, the number of Central American migrants headed north has grown to more than 7,000, a United Nations spokesman said. 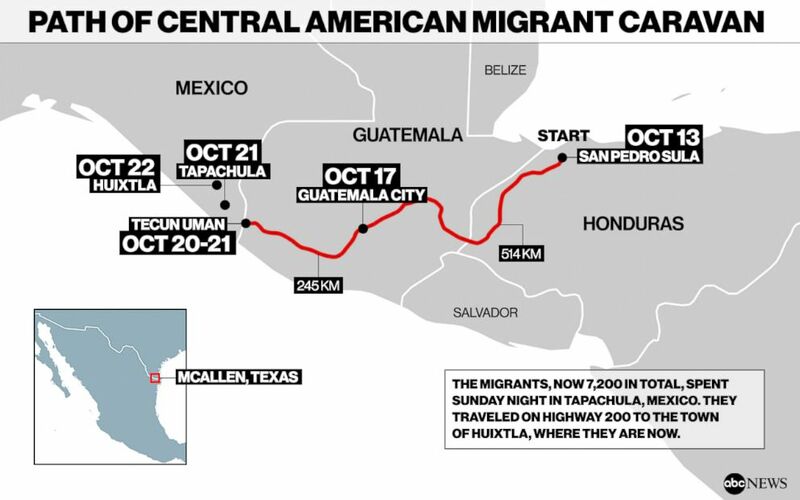 On Tuesday, the caravan was in Huixtla, Mexico, more than 1,000 miles from the closest U.S. border crossing at McAllen, Texas. 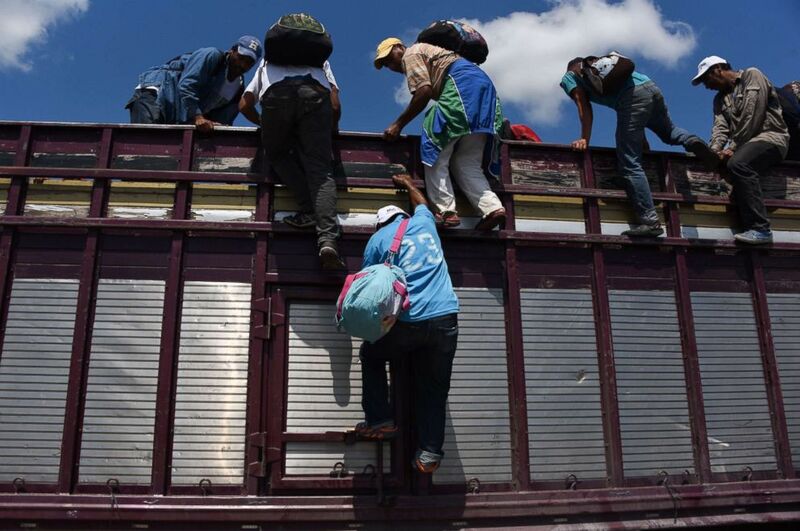 (Johan Ordonez/AFP/Getty Images) Honduran migrants heading in a caravan to the U.S., climb on a truck in Tapachula, Chiapas state, Mexico, Oct. 22, 2018. The group awoke in Huixtla on Tuesday morning after many of them walked about 50 miles over two days in near 90-degree weather. During the arduous journey, ABC News reporters witnessed several women and children passing out from apparent dehydration. Mexican President Enrique Peña Nieto warned the migrants that their dream of reaching the United States will likely not be realized. "I respectfully urge them to be aware that, if they maintain this attitude, they are unlikely to achieve their goal of either entering the United States or remaining in Mexico," he said during a business forum on Monday. He added that many of the migrants have "heeded the recommendation of the Mexican government to begin the refugee application process and be able to acquire orderly, legal migrant status." The Mexican Interior and Foreign ministries said Tuesday that more than 2,000 members of the caravan had registered for asylum and were are being housed at the fairgrounds in Tapachula. Mexican authorities said they have also received 495 requests from Hondurans in the group to voluntarily return their homes.